An average slice of packaged bread contains only 1 gram of fat and 75 to 80 calories. Assuming a sandwich was eaten for breakfast, lunch, and dinner, it would take 168 days to eat the amount of bread produced from one bushel of wheat. A family of four could live 10 years off the bread produced by one acre of wheat. One bushel of wheat will produce 73 one-pound loaves of bread. Early Egyptian writings urged mothers to send their children to school with plenty of bread and beer for their lunch. Breaking bread is a universal sign of peace. Bread is closely tied to religious expression and communion. Hot cross buns commemorate Lent and Good Friday, Greek Easter breads are set with eggs dyed red to denote the blood of Christ, and Jewish families celebrate the coming of the Sabbath on Friday evening with challah (a light, airy yeast bread made of six long strands of dough which are braided to form one large loaf). In 1997, Kansas wheat farmers produced enough wheat to make 36.5 billion loaves of bread, or enough to provide each person on earth with 6 loaves of bread. Farmers receive approximately 5 cents (or less) from each loaf of bread sold. 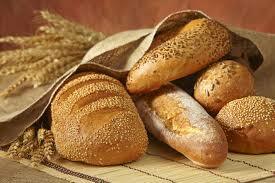 Bread is probably the one food eaten by people of every race, culture and religion. Napoleon gave a common bread its name when he demanded a loaf of dark rye bread for his horse during the Prussian campaign. "Pain pour Nicole," he ordered, which meant "Bread for Nicole," his horse. To Germanic ears, the request sounded like "pumpernickel," which is the term we use today for this traditional loaf. In Britain, the ceremony of First Footing is traditionally observed in the early hours of New Year's Day. A piece of bread is left outside a door, with a piece of coal and a silver coin, and is supposed to bring you food, warmth and riches in the year ahead. One bread superstition is that if you put a piece of bread in a baby's cradle, it will keep away disease. The fastest "bun" in the West goes to a team of bakers from Wheat Montana Farms and Bakery who reclaimed the Guinness World Record in 1995. They harvested and milled wheat from the field and then mixed, scaled, shaped and baked a loaf in exactly eight minutes, 13 seconds. Murphy's Law dictates that buttered bread will always land buttered-side down. Bread is inexpensive. At an average cost of about $2 a loaf, bread is a strong nutrition value for the dollar. In Russia, bread (and salt) are symbols of welcome. Superstition says it is bad luck to turn a loaf of bread upside down or cut an unbaked loaf. Legend has it that whoever eats the last piece of bread has to kiss the cook.